Domotz is a new company with an interesting take on network management. Their mission "is to make all of your home devices work together, better, smarter, faster and in-harmony by helping you resolve technology related issues". The Domotz vision is that as each of us acquire more network-enabled stuff, our networks become more challenging to maintain. Each of our devices may have some level of support, but, by and large, it is up to the individual to make it all work well together. Domotz wants to help address that challenge. Domotz offers two products. Domotz DIY, launched at CES 2016, is targeted at home users and designed for monitoring up to four networks. Domotz DIY runs on either a Raspberry PI or select NASes. Domotz Pro is designed for networking professionals, VARs and businesses, handling five and "up to thousands" of networks and unlimited devices. Pro requires a Domotz Box, which will be a small Intel-based Linux appliance. Domotz Pro is expected to be available by the end of the second quarter 2016. As mentioned, you can run Domotz DIY in one of two ways. Option 1 is to install Debian Linux (Raspbian) Operating System (OS) and the the Domotz agent on your own Raspberry PI computer. Domotz is working on, but doesn't yet have, a version of this product, called Domotz Mini; a custom Raspberry PI with the OS and Domotz agent pre-installed. Option 2 is installing the Domotz agent on a Synology, QNAP, or NETGEAR ReadyNAS NAS. Domotz sent me a Raspberry PI with the agent software already loaded, so I did not have to install software on either a Raspberry PI or a NAS. For installation support, Domotz' support site has step-by-step instructions for installing the agent on a Raspberry PI. Looking at the steps gives me the impression they are for those who have some technical savvy. The Domotz support site also has instructions for installing the agent on a NAS. If you have the right NAS, the NAS steps appear no harder than installing any other application on your NAS. The upcoming Domotz Mini product should expand the product's appeal to those without technical savvy or a NAS. In my mind, Windows and Linux-based agents could also expand the product's appeal. It can take up to 15 minutes to discover all the devices in your network. We use a continuous discovery procedure after the initial scan. I mirrored the switch port my Domotz agent was connected to, to take a look at its discovery procedure. It looks like the Domotz agent is continuously sending Address Resolution Protocol (ARP) requests to every IP in your local subnet. As you can see in theWireshark trace screenshot, Domotz is sending ARP requests from the agent (172.24.2.141) to consecutive IPs in my network subnet (172.24.2.0/24). Once a device is discovered, Domotz maintains a "heartbeat" between the Domotz agent and the device every 30 seconds. If you're running multiple VLANs (and subnets) on your network, the Domotz agent can be configured to monitor devices on each VLAN or your entire network. Multi-VLAN monitoring requires the Domotz agent to be connected to a properly configured 802.1q trunk port on your network switch. You can find VLAN configuration instructions on the Domotz forum. Devices are discovered based on MAC address. Once discovered, the Domotz agent does a lookup on the first 6 digits of your device MAC (also known as the OUI), to determine the manufacturer of the device. Domotz will then display each device based on MAC address, IP address, and manufacturer. Once the Domotz agent is installed and running, it communicates everything to Domotz' cloud. From that point, you view and manage your network via either a browser or iOS or Android apps. Domotz has a pretty good knowledge base covering most aspects of both the web and handheld apps. The web interface is available on Domotz' website. All you do is log in with the same email address and password you used during account setup. From the web app, you will see the dashboard below, identifying the number of discovered devices, results of a recent network speed test, configured alerts, and options for collaboration and providing the app to a friend. I had no problem running the browser interface on a Windows 10 PC using Chrome, Firefox, and MS Edge. I also installed the app on an iPhone 5s running iOS 8.1.3. The dashboard on the handheld app is pretty much the same as the web app, designed to fit a handheld screen, shown below. The Domotz agent lists discovered devices by MAC, so you'll want to manually edit each device with a specific name and location, device type/icon (there are about 30 pre-built device type/icons, such as game console, NAS, network equipment, PC & Notebook, Mobile, etc...), specify device category (Important or Indifferent, (indifferent = not important), and whether the device is flagged as Favorite. The categories and favorite flags are helpful in grouping devices in the device view. The below screenshot shows a partial list of devices on my test network. I've edited the device names, their locations, and their device type/icons. The Domotz agent monitors devices by sending a heartbeat to each device every 30 seconds. In the History section of each device on the app, you can see when each device's heartbeat is lost and recovered. Knowing the number of devices on line and when they're on line is a useful network troubleshooting tool. If a larger number of devices are using the network at the same time, like in the evening, you have a possible indicator of slow network performance, resulting in symptoms like lower quality Netflix streaming. Domotz device monitoring also appears to be useful as a parental tool for tracking TV and Video Game usage. I have a PS3 on my network and the Domotz device history in the app, shown below, lists the times and dates it has been on and off based on when the Domotz agent received a response to the heartbeat. Email alerts, and push notifications to the Domotz mobile app, can be sent when a device fails to respond to a heartbeat, when a device is considered down, and when a device comes back up. Devices are considered down if they fail to respond to four heartbeats. You can configure a standard alert profile where you select whether to be alerted on lost heartbeats, device down, and device up, and whether to be sent emails and/or push notifications. The standard alert profile can be applied to multiple devices, or you can create a custom alert profile for each device. The Domotz apps allow you to set alerts on none to all of your devices as you choose. Further, Domotz sends alerts from the cloud, so it is not dependent on the local network. I found it useful to enable Domotz alerting via push notifications and email simultaneously. Getting a push notification to my handheld is useful for immediate notification, and having the notifications in my email inbox helps with keeping an event log. The Domotz app has several network tools to provide a better picture of your network. It has a tool called Route Analysis, which is essentially a ping tool that sends 10, 20, or 50 pings to Spotify, Facebook, Google, or a website of your choosing. The results of this test give you an indication of whether there is any packet loss to your router, to your ISP, and to the target website. Below is a screenshot of the Route Analysis tool where I sent 20 pings to Google. Another useful Domotz diagnostic tool is the speed test tool. The Domotz speed test tool uses perfSonar software and automatically detects the nearest perfSonar server to run the test. This tool allows you to trigger a wired speed test on your home network. This is a great tool if you're experiencing poor Internet speed and want to measure the performance of your ISP. Below is a screenshot of a speed test I ran on my network showing I have about 57 Mbps download and 5.8 Mbps upload. The results of this speed test are pretty close to the results I get from speedtest.net, a commonly used website for speedtests. The Domotz agent is also monitoring your Internet connection. To monitor your Internet connection, there is a "keep alive" signal sent between the agent and the Domotz cloud. If the keep alive to the Domotz cloud is lost, the Internet connection is considered down. My Internet connection actually went down during my testing period, and Domotz captured that outage (from 12:03 AM 2/18/16 to 2:20 AM 2/18/16) shown below. A downside to the Internet connection monitoring feature is Domotz doesn't have an alert for Internet down, which would be useful. Domotz reports they are working on adding this alert. Via the the Domotz apps, you can also remotely connect to devices on your network. Web Portal and Remote Desktop access is available today, with Console access labeled as a feature "Coming Soon." I was able to remotely connect to my ReadyNAS admin screen by selecting the Web Portal option, specifying port 443 and https as the connection parameters, shown below. Clicking Open Connection resulted in getting prompted for my credentials, and I was logged into my NAS' admin menu. I had varying results with remote web interface access, as I was also able to connect to the web interfaces of a Cisco SG200 switch, but had trouble connecting to a Netgear GS108T switch, Linksys RV042 router, and QNAP NAS. It's great Domotz was able to integrate remote connection software into their app. The end result is the Domotz app basically provides VPN access to your network, without the hassle of setting up a VPN router or VPN client software. Another interesting Domotz remote access feature is integration with smart IP devices, which allows the Domotz app to be a controller for home automation devices. Domotz lists support for Belkin Wemo, Digital Logger, Time2, WISPP, and Orvibo IP power switches, and they are working to add support for more smart IP devices. With right IP device in your home, you can turn off lights and other devices via the Domotz apps from anywhere. We'll post an update to this review when we've had a chance to test one of these devices with the Domotz app. The Domotz app allows you to grant temporary guest access your network. However, that guest first needs to set up a free account on Domotz.com, which involves entering an email address and password. Once the guest has created an account on Domotz.com, you can extend them an invite via the web or mobile app by entering their email address into the Collaboration menu, shown below. The guest then logs into the Domotz web app and accepts the invitation. They now have access to your Domotz dashboard, device list, network diagnostics, and alerts menus, the same as you do. To remove their access, you click on the guest's email from your web or handheld app and delete them. In my test, I had the guest account logged into my network and I deleted the guest email. My guest access was immediately terminated. We have reviewed several other small network monitoring systems, including Cisco's OnPlus and Belkin's Pulse. There is also a free network discovery tool called Fing with an associated monitoring product (not free) called Fingbox. All of these products, including Domotz, aim to provide a picture of your network and assist with monitoring, alerting, and troubleshooting. When I reviewed OnPlus, it was about $7/month per customer site. Belkin's Pulse product, which was developed and eventually sold directly by a company named Jumpnode, ranged from a free product with limited functionality, to monthly service charges ranging from $49 per month to $199 per month based on the number of devices being monitored. Fingbox is about $6.50/month for the Home version to $14.00/month for the Pro version. Domotz DIY is only $2.99/month for one agent and an unlimited number of devices. You can monitor up to four locations with Domotz DIY, but each location requires its own agent. The free trial period is 90 days, and didn't require a commitment or entering a credit card! I like Domotz' provides the option of running its discovery and monitoring agent on a NAS or inexpensive Raspberry PI. 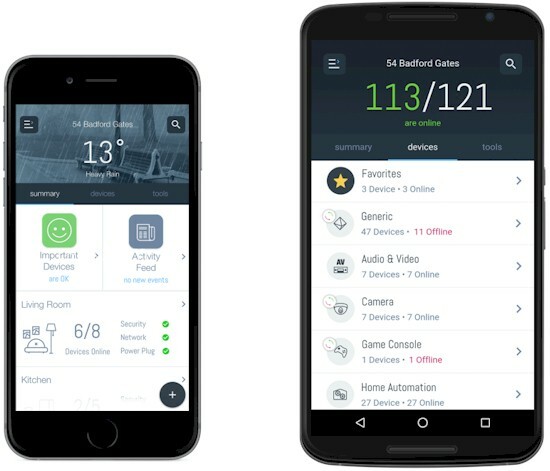 Other neat Domotz features include remote device access and giving a third party temporary access to your network and integration with home automation devices. But do many consumers really need what Domotz offers? Sure, it's nice to know when network device drops offline. But for most of us, spouses, kids and roommates take care of that. Domotz' ability to provide an inventory of all networked devices can be handy, too. But the aforementioned Fing does that nicely and other free tools (nmap) are readily available. The same is true of Domotz' internet connection monitoring and diagnosis tools; there are plenty of other options available (nmap, ping, tracert, etc.). The two most useful features Domotz' provides, consolidated remote device administration access and the ability to grant access to Domotz' toolset to a third party, are more suited for network techs and service providers than average folks. What would be more likely to get us to part with $3 a month would be features like knowing when something was connected that shouldn't be or whether any device was doing something suspcious. And how about traffic logging and reporting and bandwidth monitoring and alerts (both general and individual device)? Overall, I found Domotz to be a functional network monitoring tool with plenty of opportunity to grow. But I think it would be better served concentrating on selling to small network VARs and installers. Most consumers simply won't find sufficient value in Domotz, not even for $3 a month!